PRIMO VOLPI, veteran Italian roadman who started the first Tour of Europe in Paris on September 21 as one of his country's best entrants and a well-fancied favourite, finished the 1,600 miles through five countries in 13 stages of this rumbustious, much antagonized stage race on Sunday winner by 2 min. 17 sec. 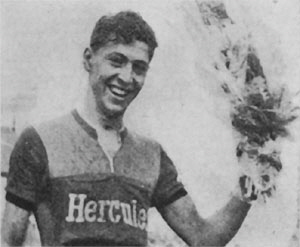 Second, and race leader for most stages, was young Belgian Hilaire Couvreur. Third, at 2 min. 42 sec., and completing Italy's triumph was Pezzi, one of the event's most volatile riders. Volpi won the Tour of Europe on his time trial abilities. Second for days, 25 sec. in arrears of a Couvreur bastioned by the best all-round team in the race, Volpi just could not get clear long enough to establish a vital lead. Then, just before the 11th stage started, he was given an 11-sec. race lead by a reversed decision (see below), and a consequent psychological advantage over Couvreur, whose position he took. It was more than enough. 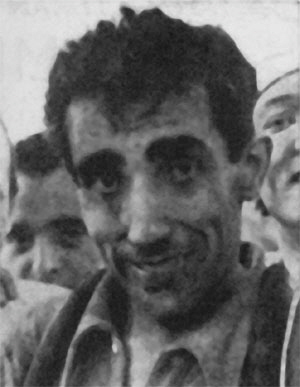 When the unpaced 62 km of the 11th stage were over, Volpi, time trial winner by 2 min 6 sec, was race leader by 2 min 17 sec - and that was his margin as the sadly depleted field disputed its last finish in Strasbourg, France. But from British cyclists the applause must be for a more familiar name than those which high-lighted the very top of the finishing list. 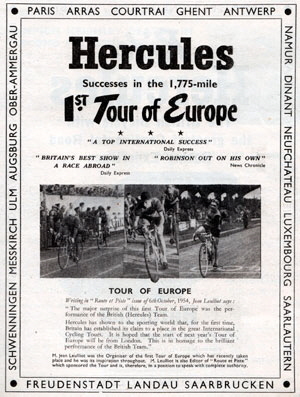 For, in fact, Fred Krebs, 22-year-old Hercules professional, who, after jumping five places in three days, rode into Strasbourg as Britain's best-ever finisher in a major Continental stage race. Krebs was fifth, 17 min 6 sec down on Volpi, after a race the daily distances and weather conditions of which were the toughest yet encountered by a British element abroad. Out of 70 starters and 30 finishers, one or two of them stars, others on the way up, the only four names ahead of that of Krebs in the result were: Volpi, Couvreur, Pezzi and Swiss Huber. 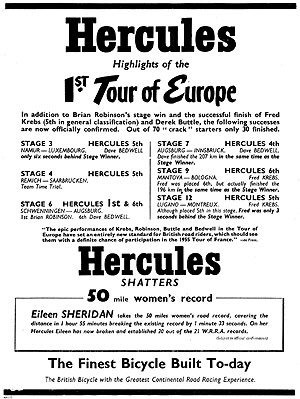 Of equal excellence was the riding, before enforced retirement due to leg trouble, of Brian Robinson, newest recruit to the powerful Hercules camp. A stage winner (see Cycling, September 30) and sixth on general classification after eight days, Robinson came out in atrocious conditions in the ninth stage, along with Dave Bedwell. Bedwell, too, when stomach trouble forced his retirement, had achieved one of his most creditable performances. Although 25 min 14 sec in arrears on overall time in 14th place, he had figured in a number of final sprints and acted as a first-class team-man to Krebs and Robinson. A special word of praise must go to Derek Buttle, eventually 27th, 7 sec under two hours down and Britain's only other finisher. His assistance to every member of the team, often seen in races at home and involving personal sacrifice in many cases. was undoubtedly reflected in the successes of his colleague. With seven stages to go after Robinson's stage victory on the sixth day, and some consistently good riding from other members of the team, the general classification, headed by Couvreur, saw Robinson 9th at 9 min 16 sec; Krebs 16th at 18.45; Bedwell 24th at 30.51, and Buttle 38th at 56.35. And although the seventh stage, 206 km from Augsbourg to Innsbruck, did not result in a British victory it could be counted as one of the most successful of the race for the team. Conditions were tougher than ever. The day's route crossed the Bavarian Alps and included the Cols of Fern-pass and Holzeiten; rain drenched the riders over every slippery kilometre and, with a minimum altitude of some 2,000 ft., cold also took its toll, resulting in general exhaustion, retirement and time loss. Notable retirements were Frenchman Lerda and Swiss Metzger, who starred in an unsuccessful chase after Robinson on the sixth stage. A tragic note had been struck before the day began with the death of young Swiss rider Jacquet, who crashed into a car at the finish at Augsbourg. The first 70 km were uneventful, but at Garmish-Partenkirschen (75 km) Bedwell, Italians Pezzi, Frosini and Para, Frenchmen Diet, Marrec and Modenese, and Belgian Van Dormael pulled clear. At 135 km they were 5 min 10 sec up but, during the climb of Fern-pass, Robinson, Krebs and Swiss pair Huber and Schellenberg left the peloton in pursuit. At the top of the Col Robinson and Huber were 4.01 min down on the leaders; Krebs and Schellenberg were at 4.55, and the bunch at 6.10. Immediately after the descent came the climb of Holzeiten and Modenese decided to try his chances alone. At the summit he had half a minute over the leading group of seven, with Robinson. Krebs and the two Swiss at 5.01 min; Italian Volpi at 51" min. ; race-leader Couvreur, beginning to get worried, and Frenchman Met at 6.10; and the field at 7 min. With 25 km. to go Modenese had increased his lead to 1.25 over Bedweli, Pezzi, Diot, Van Dormael, Marrec, Frosini and Para, with the British-Swiss quartet and Volpi at 6 min. and Couvreur and Mel at 6 min. But the pace stiffened over the final kilometres; with 10 to go Modenese was caught by the Bedwell group. It was in those final stages that Krebs, and especially Robinson after his tone victory the day before, produced another scintillating showing. They dropped the two Swiss and, with Volpi, made up minutes on the leaders to finish only 3.31 down and 2.4 ahead of Couvreur. Meanwhile Bedweil had achieved fourth place in the sprint to Diot, easily recording his second stage win by holding off Marrec and Frosini. The result for the Hercules riders was a big rise in overall places, Robinson to sixth, at 7.22; Krebs to 10th at 16.41. and Bedwell to 14th at 25.16. Battle finished 25th at 14.25 for 32nd on general classification, 1.5.25 down. Stage eight - from Innsbruck to Mantoue, in Italy, and at 304 km. the longest of the Tour - was not particularly animated despite an initial 38 km up the Brenner Pass. The sun at last came out and the 40 men still in the race more or less sat back to enjoy it, with only one breakaway - of six riders at 80 km., later joined by two more - occurring, and that allowed to attain an 18-min. lead before some sort of reaction occurred in the peloton after 250 km Robinson punctured on a bad stretch of road, but had no difficulty in rejoining, and the final sprint between the leaders 7 min 13 sec ahead of the main field went to Frenchman Bois. Couvreur stayed 25 sec ahead of Volpi and 1.23 ahead of Van Dormael on general classification, and the Britishers. Bedweli finishing 16th and Krebs, Robinson antiequal 19th in the bunch, maintained the previous day's time arrears although Krebs dropped a place to 11th. Stage nine, 196 km. from Mantoue to Bologna, was a catastrophe for the Britishers. Brian Robinson sixth on general classification, a stage winner and easily on a par with the remaining opposition, had been bothered with his knees; on this stage, ridden in icy rain, the trouble reached a peak and he was forced eventually to retire as the pace hardened towards the end. And Dave Bedwell, 14th on general classification after a number of good finishing places, suffering with his stomach, also left the struggle. Both men came out after the peloton broke up with 50 km to go. The day's first break came when race-leader Couvreur and his team-mate Cerami left the field for a 20-sec. lead soon after the start. They were pulled back. as was an attack including Couvreur, Volpi and Van Dormael (one, two, three on classification) at 90 km, and another including Krebs at 124 km. Then, in a hail-storm with 50 km to go and visibility almost nil, Van Dormael and Italian Pezzi got clear. They stayed away to within 2 km of Bologna but conditions were against them, and it was a bunch of 30, six of them crashing, who disputed a track finish easily won by Frosini of Italy from Frenchman Michel and Swiss Schellenberg. Krebs finished with the leaders to regain 10th place overall, 16 min 41 sec down on Couvreur, who led Volpi by 25 sec with Van Dormael at 1.23 and Pezzi at 1.45. Brittle finished 36th at 19.6, remaining 32nd in the race, 1.24.41 down. General exhaustion so affected the 35 men remaining in the Tour that, not one move occurred on the 10th day. Bologna-Como (264 km), until 120 km had been covered. The offensive at Secugnano (162 km) of Schellenberg - a cousin of Ferdi Kubler - and Italian Verdini met with most success. In 13 km they had a 1-min, 20-sec lead over Belgian Jochums, Frenchmen Burgat. Bois and Resler and Para, and 2.35 over the peloton. But more men had begun the chase - including Krebs and Italians Pasotti, Zampieri and Frosini. At 186 km. Schellenberg and Verdini, riding at more than 30 m.p.h.. were 1 3/4 min. up on the Jochums group: 3 1/2 min. up on Pasotti; and 4 1/4 min. ahead of a group led by Krebs, with the peloton at 5 min. The pair were never caught. Schellenberg beat Verdini in the sprint; 4 min. 12 sec. later Jochums beat Pasotti (who had got up to the second group at 200 km.) for third place; and at 7.13 Krebs came in for 12th place after having trouble with his chain. The bunch. including the top four men on overall time, trickled in 11 min. 17 sec. down on the Swiss winner. So Krebs' hard chasing efforts paid first-class dividends with a jump of three places to 7th on general classification. 12.37 down on Couvreur. Battle finished with the peloton for 20th place and dropped one place to 33rd in the race. Volpi, given an 11-sec race lead by a reversed decision (see above), must have been stimulated by this unexpected gift, for in the 62-km. time trial from Como to Lugano that was the 11th stage he finished 2 min. 6 sec. ahead of Couvreur after leading throughout, and so went into a 2-min 17-sec. race lead with only two stages to go. Van Dormael, who had been second to the flying Italian at 22-. 32- and 42-km. time checks, fell back over the last 20 km., and it was the Frenchman. Siguenza, who finished third. at 2 min. 13 sec., with Swiss Huber in fourth (at 2.56) and Italian Massocco fifth (at 3.121. Krebs finished a creditable 11th, 4.54 down on Volpi, to retain his 7th place on general classification, 17 min. 6 sec. down on the Italian. Pezzi deposed Van Dormael. from third place on overall time and Huber lay fifth. Battle, 22nd in the time trial, 9.40 down on the winner, came back to 32nd on general classification. From 10th to fifth in three days was the score of Krebs after the 245-km, 12th stage from Lugano to Montreux, highlight of which was the 6,000-ft. climb of the Cut du Simplon. His policy was attack; he attacked from a peloton of 26 (35 remained in the race) on the early slopes of the big climb, and it payed off. Before Krebs' move there had been little activity. When he made it eight men went with him - Huber, Sorgeloos, Schellenberg. Couvreur, Russenterger, Cerami, Volpi and Gianneschi. Huber won the sprint at the top of the 16-km. climb. and by 140 kill, the group had a lead over Assirelli of 7 1/2 min. with Modenese at 8 min. and the field at 8 1/2. Sorgeloos and Cerami both punctured, but they got back quickly, and with 10 km. to go Cerami pulled clear on a long hill. taking Schellenberg and Gianneschi with him. The trio just held out to the line, Cerami taking the sprint and Couvreur beating Krebs for fourth place - 3 sec. later. The Britisher now moved into fifth place on overall time, 17 min. 6 sec. down on Volpi. Bottle finished 24th at 26 min. Traditionally the last stage, a long 344 km. from Montreux to Strasbourg was not very lively. Van Dormael tried to break right after the start in a final desperate Belgian effort but was soon pulled back. Race-leader Volpi went ahead to win the Prime over the 7,000-ft Col Vue des Alves at 110 km, but did not maintain his effort. Finally Cerami got clear, taking Siguenza, Close and Modenese on his wheel, with 26 km to go, and, beating them in the sprint won his second consecutive stage victory. Krebs finished ninth and Buttle 13th, both in the peloton. RACE LEAD CHANGES BETWEEN STAGES ! SOMETHING that seems to be inescapable in a Continental stage race, a major upset between teams, occurred before the 11th stage of the Tour on Friday. Belgium threatened to retire. Why? During the 4th stage team time trials, the Belgian team lost 36 sec. at a closed level-crossing gate. The international official following the team recorded the time loss, and, after the stage, a board of commissaires decided that it should be deducted from Belgium's time. Because of that decision, Belgium beat the Italian Arbos team by 9 sec. in the team time trial. Immediately, Italy protested to the F.F.C. And the French decision came last Thursday night. It was that the 36 sec. should be added to the Belgian time because the loss had not been recorded by the event's official timekeeper. And the result? Belgian Couvreur, race-leader by 25 see. from top Italian Volpi, was relegated to second position on general classification by 11 sec. 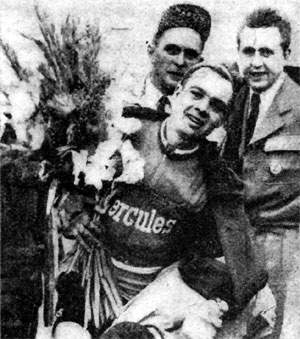 BEFORE the start of the final stage from Montreux, Krebs and Buttle asked the Tour of Europe organizers to deduct 25,000 French francs (£25) from their prize money to be passed on to the mother of the young Swiss rider Jacquet who died after being involved in a collision with a car at the end of the sixth stage.